Looking at the Attack Of The Show schedule there is a segment called DVDUesday, it is described on the AOTS website as - "Our resident film expert, Chris Gore, of Film Threat Magazine, visits every Tuesday to give us all the news on the world of DVDs, new, old, collectable, and strange." The image of the legs is taken from the Attack Of The Show hosts page. I'm fairly sure this will be a new URL that we will get on Tuesday. Looks like it will be a late night for me ! Although I do think the URL will be displayed in a video clip, as that is what this segment on the show normally does. Not sure if any one has mentioned it but on the AOTS website you can watch the old DVDUesday segments and one of them is a review of the Lost Season 1 & 2 Blu Ray sets. So a review of Lost Season 5 on Blu Ray this Tuesday ? I seem to be on my own at the moment, but it's off to the gym for me. good morning Zort ! I'm here but getting ready for the last day before school starts. I'll be in and out all day. morning Zort and lisa, enjoy today and Monday. Mr. Gore is amongst the evacuees. The reviews are for what's currently being released, right? I checked everything that's coming out Tuesday Sept. 1 2009 and I didn't see anything that looks like it could be related to Lost. But who knows what they'll do. I'm sure they'll work it in some way. Scary news about the fire. I've just noticed that the ABC Mysteries of the Universe site has been updated, there is a Medical Station Dharma logo displaying now. This is in place of the third video which is released on the 8th of September. I wonder if that new video will reveal a new piece of art ? Would be cool if the two ARGs linked together. AOTS comes on at 7:00pm EST daily. We want to watch Tuesday for the DVDuesday segment in that show with Chris Gore. Zort: You are SO on top of things! Thanks! Scoutpost: It's airing Tuesday at 7PM EST. I've got it set for 4PM PST...take it from there. Oh AOTS is on G4. I don't know what channel it would be in your area. It's 129 in mine. G4 is 310 on my DirecTV. The biggest fire is about 40 min. from us and is creating quite a spectacular sight. Every morning we get overwhelmed by smoke drifting our way and can't go outside! Wow, 40mins is about 5 mins in wildfire time if winds are strong! Hope that you and your house stay safe Maven! Praying for rain. We really are in no danger (except from smoke in the air)! The fire is gigantic but is going north and east (we are way west of it). The good thing is that there is no winds (which makes it difficult for air drops because the smoke goes straight up and they can't see the fire from the air). But is an awesome side. Thanks for the DVDuesday info everybody. I'll try to tune in here as soon as I get home with the kids on Tuesday. Maven glad to hear that you're not in danger...I didn't think you were, but I knew it was really on the move today and wasn't sure if it was coming your way. Hope they're able to get it out/contain it soon! 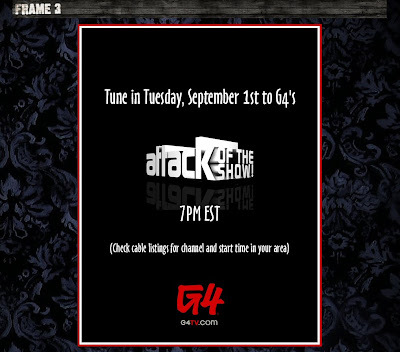 Just relaised that the photo with DVDuesday on it is from the Hosts page on the G4 AOTS website. But I would doubt a review, he gets his hands on things earlier than everyone else, but this is early even for him to get his hands on. It would be a nice tie-in to ABC to include the next poster info with a review of S5 DVDs! Fire has doubled in size to 85,000+ acres and 2 brave firefighters lost their lives yesterday. Still very smokey, but I'm in no way threatened by the path of the fire. Sad that 2 firefighters lost their lives. Well, that is one hell of a confirmation of the Attack Of The Show link posted on the hub page ! Yup, no doubt where or when to go now! Glad you're ok Maven...sorry to hear about the firefighters though. LOL Yeah That's hard to miss or misunderstand. So we get to see a September Attack sponsored by a group of artist? Did we ever fiqure out the meaning of this photo besides it being taken by a hairy or hairless art student? Jo of JOpinionated fame posted a link to LostArgs on Facebook saying that this is THE place to keep updated on all things going on this hiatus! Thanks, Jo! And a Happy 4th Year Anniversary of posting, blogging and commentating about LOST and other TV shows! thin - I think we were all assuming it is just a closeup of the skateboard deck to tease us. Nothing more interesting than that. Maven, there is lots of love for LostArgs from the other blog sites at the moment. Yeah I've been noticing alot of places mentioning our blog. And it's right up there in the Google searches too. We're a day late on the Birthday/Aniversary wishes for the TLC. Better late than never though, right. I was looking at birthdays about a month ago at TLC then forgot our aniversary until I seen your post. The Anniversary wish I made was for Jo and her blogging. Completely forgot about TLC anniversary! Jo's link at FB has been getting a lot of favorable comments towards LostArgs! Yay for TLC and LostARGS! No pressure Zort, heheh. oops I'm sorry. I misunderstood your post. So who will be watching tonight ? I'm going to try and stay up and see what happens, but I can't get the channel over in the UK. Well I certainly hope anyone who comes here to follow the ARG feels welcome. We do our best! I will be here tonight (this afternoon for me), but a little late because I have to drop my son off for therapy after school. Everything will probably be figured out and revealed by the time I get here, but I will be here! I will watch in real-time. I will post updates here and on twitter if people want to follow (tmag25). I'll be watching. I'll post whatever I find out. To detail the events of this evening.